False Unicorn Capsules - 700 mg, 60 Vcaps™ each (Helonias dioica) - Penn Herb Co. Ltd.
False Unicorn’s therapeutic uses date back to Native American culture. Today, herbalists, midwives and women all over the world continue to rely on the powerful reproductive tonic to support and balance female health & well being. 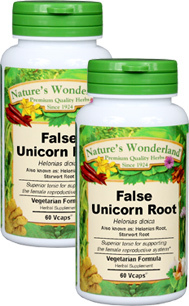 Find False Unicorn in Nature’s Wonderland’s most-requested herbal formulas including Hormone Regulator ™, Female Corrective ™, Hormone Estrogen ™ Blend, and Prenatal Formula™. COMMON NAMES: Blazing Star, Chamaelirium luteum, False Unicorn, Helonias, Starwort. Supports hormonal balance; herbal support for a woman’s monthly cycle; promotes menopausal health; promotes digestion; supports intestinal health. As an addition to the diet, take 1 or 2 capsules three times daily with water at mealtime. IF YOU ARE PREGNANT SEEK THE ADVICE OF A HEALTH PROFESSIONAL BEFORE USING THIS PRODUCT.